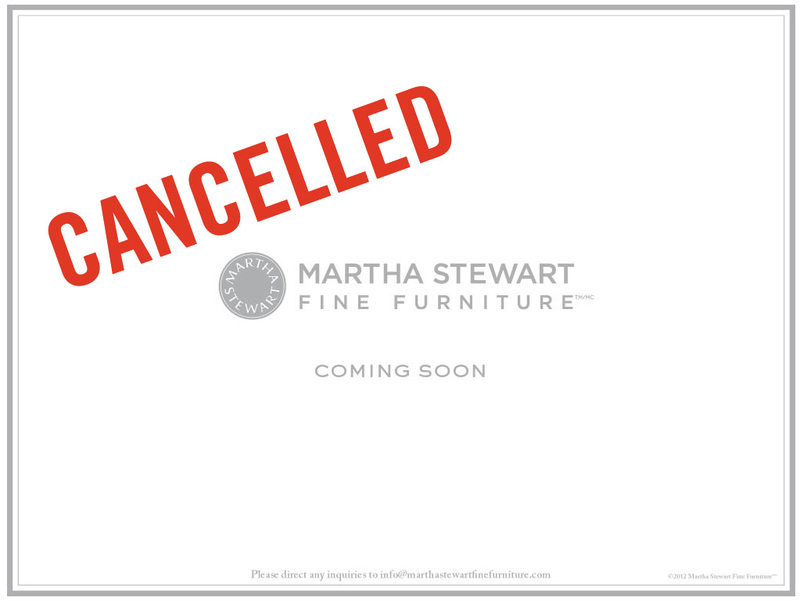 Don’t be looking for the Martha Stewart Fine Furniture website to launch anytime soon. The entire MSFF project is on hold for now, I’ve learned. It’s not clear if the delay is related to the recent restructuring at MSLO, the departure of CEO Lisa Gersh, or to another issue. I’ll publish additional details as they become available. FOMs: Dagnabbit, right? I so wanted to see Martha’s eye for quality design extended into the furniture realm, didn’t you? Hopefully we won’t have to wait too much longer. Originally scheduled to launch this month, the Martha Stewart Fine Furniture (MSFF) website launch has now been moved to August/September. I will update with additional information as it becomes available. Well, FOMs: Looks like we will have to wait a little bit longer to browse the MSFF collection. I can’t wait! UPDATE: I’ve heard from Miles Talbott’s National Sales Manager that the launch has been moved to September/October. (Today’s date is 10/02!) Seems like they’d want the site up and running by the time Martha’s new cooking show debuts on PBS–which is this weekend–right? Martha Stewart Fine Furniture Website is on Its Way! The URL for Martha Stewart Fine Furniture is now live! There is no content yet, and no way to provide one’s email in order to receive updates, but those features are almost certainly on their way. I am certainly excited to see what Martha has in store for us, especially after seeing her speak about it in an interview. As I stated earlier on this blog, I received this reply from Richard Graves, the National Sales Manager for Miles Talbott, regarding the collection’s launch timeline: “The web site information should up and running by June with support hard copy literature following.” Can’t wait to see it! In this interview Martha discusses some of the inspiration behind her upcoming line of high-end furniture, Martha Stewart’s Fine Furniture. She also discusses, briefly, her upcoming show on PBS, Martha Stewart’s Cooking School. Seems PBS has chosen Martha as the heir apparent to certain much-beloved cooking show host on PBS. Go Martha! Furniture Today’s Ray Allegrezza talks to Martha Stewart, who unveiled her new Martha Stewart Fine Furniture collection in the Miles Talbott showroom at the spring 2012 High Point Market. With the upholstery made by Miles Talbott and case goods imported from Colombia by Lefa, the new collection includes 25 upholstery and 55 bedroom, dining and occasional pieces. via Martha Stewart debuts furniture line at Miles Talbott – YouTube. Martha already has furniture available at Macy’s, Home Depot and Home Decorator’s Collection. Now, higher-end furniture company Miles Talbott has announced its own Martha Stewart Fine Furniture collection. In San Francisco, the furniture will be available at the Loggia Showroom (San Francisco Design Center) and Wynne Alex (at Sacramento & Broderick Streets). Prices are expected to be at the top of Miles Talbott’s price range. As of this morning, I did not see any additional information on the collection online. FOMs, please add links to furniture images as they become available! Martha Stewart said she loves designing furniture and wants to make it usable for the average homeowner as she unveiled her new Martha Stewart Fine Furniture collection in the Miles Talbott showroom Saturday. via Miles Talbott unveils its Martha Stewart collection.